I never, in my wildest dreams, thought I would end up being in Denmark. It always seemed just so very far away. But once you’re over here in Europe any distance seems manageable. It did still seem sort of far away, since we had to take a plane, but we only had to spend 90 minutes in the air and we were out of Basel and landing in Copenhagen. So, really, not too far at all. Copenhagen began life in the 10th century as a simple fishing village. In fact, it’s name is a derivative of “merchant’s harbor.” Not surprising given how much coastline it has. One of the legends/rumors/unsubstantiated history stories about Copenhagen is that is was founded by one of the most awesomely named people in the history of the world: Sweyn I Forkbeard, son of Harald Bluetooth (who the actual Bluetooth phone thingy was named after) and father of that also awesomely named Cnut the Great (the Prairie Home Companion listeners will recognize this name from the Sons of Cnut lodge). I would like to believe this is true and so I will. As Copenhagen became more important as a maritime town, the Hanseatic League (which sound like some sort of secret organization out of a comic book, but what we really kind of a union/federation of port towns in the Baltic from London to Novgorod) took notice and tried to force them into joining. They initially resisted, but 1368 they attacked Copenhagen and Helsingborg so fiercely for two years that King Valdemar IV of Denmark and his son-in-law King Haakon VI, the King of Norway, were forced into an agreement to pay the League 15% of the profits from all Danish trade. 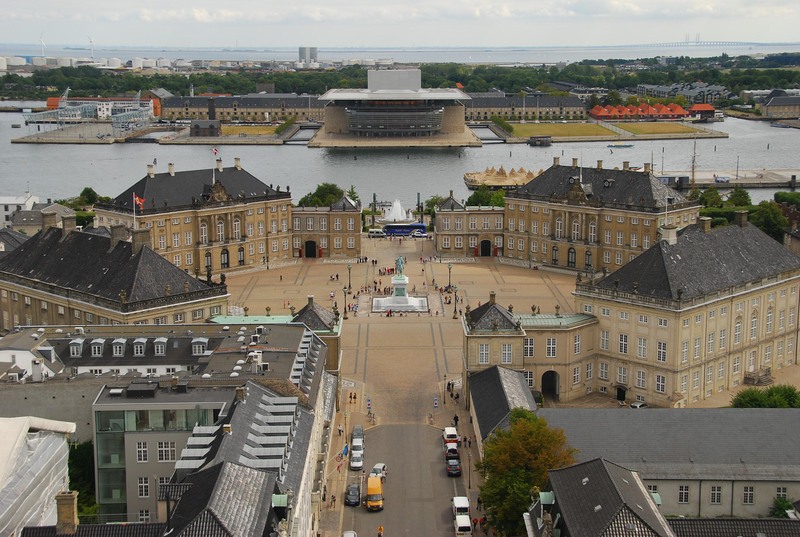 The Kings and Queens of Denmark also recognized the importance of Copenhagen and made it their capital and home to their palaces and government offices. 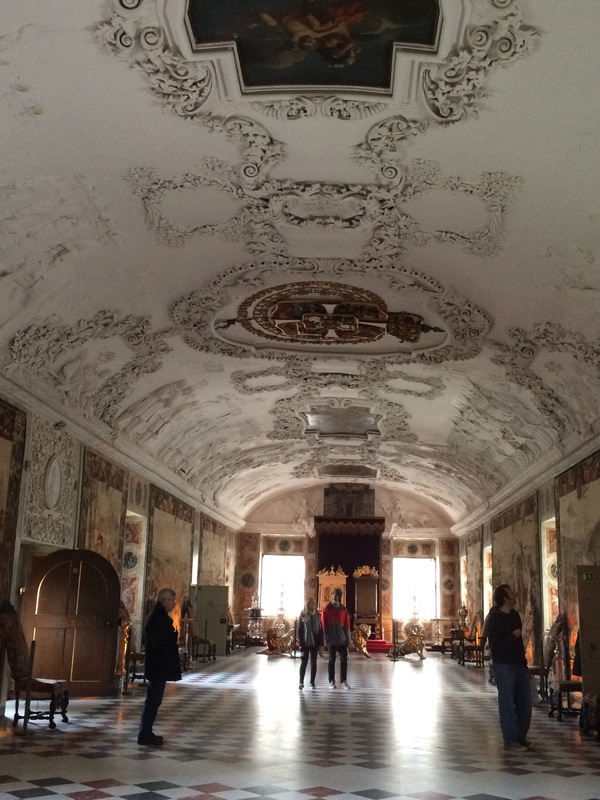 Frankly, Copenhagen is packed with palaces. Many of them have been turned into museums or other public buildings. 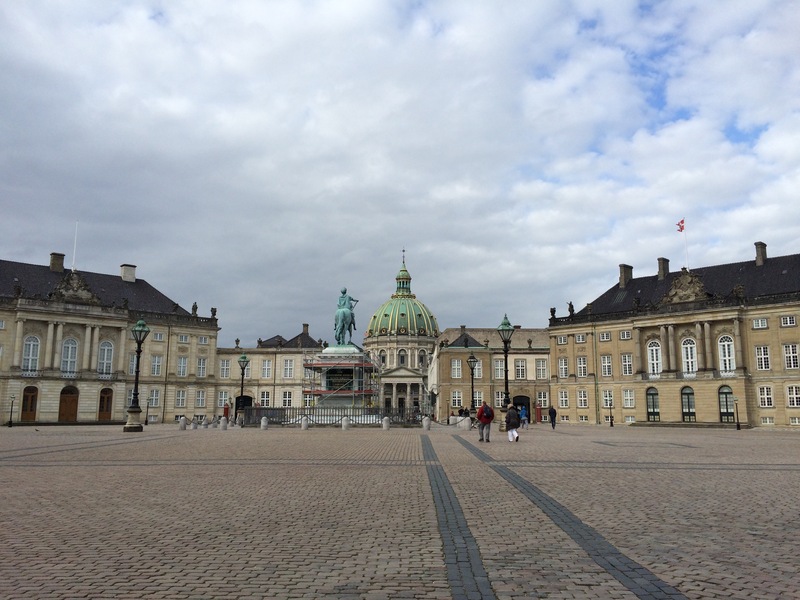 Three palaces are still in use: Amalienborg Palace, Christiansborg Palace, and Rosenberg Castle. 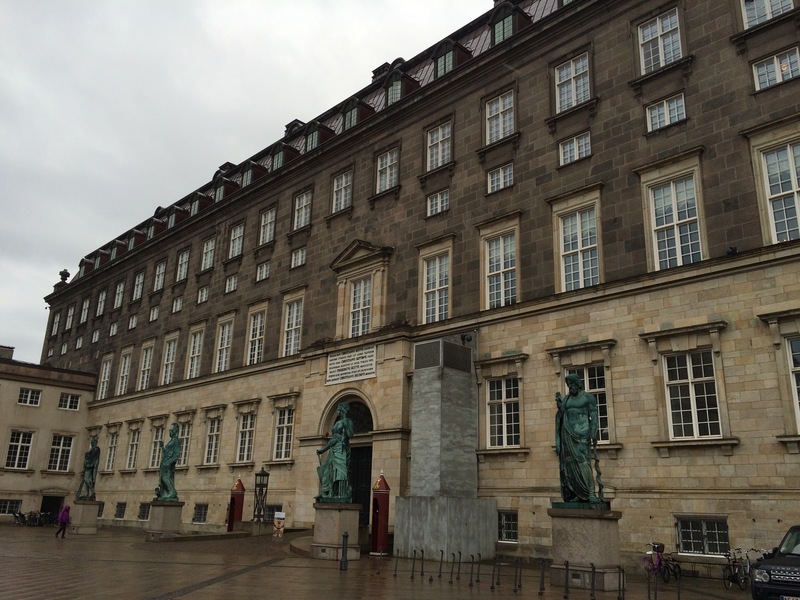 Amalienborg Palace – Amalienborg Palace wasn’t built to be a palace for the royal family. It was built for several different noble families. And if you look at it from the air in this public image I found via Google you can see it looks like 4 large houses sharing a central court yard. Sort of like the world’s first housing development. The royal family bought it and took it over as a main residence in 1794 when Christiansborg Palace burned down during a large fire that also burned down a large portion of the town (and pretty much completed the destruction of the oldest part of the city that began after the fire of 1728). It is currently the home of the royal family during the winter. Each entrance is guarded by royal palace guards in fancy dress similar to the English palace guards. The guards had the same guard houses that we saw in Scotland and they kept up a pacing march that guarded the front doors. While we were standing there a black town car pulled up with some larger black SUVs and the car went into those doors you see above while the SUVs peeled off and went out another exit. Cool, huh! 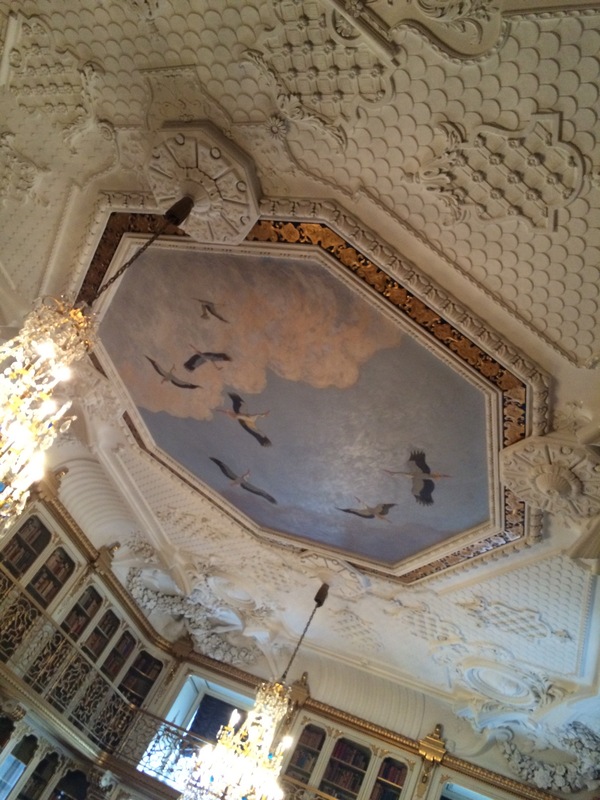 The buildings were built in a Baroque style and if you take the tour you can see that the interiors are Danish Rococo. 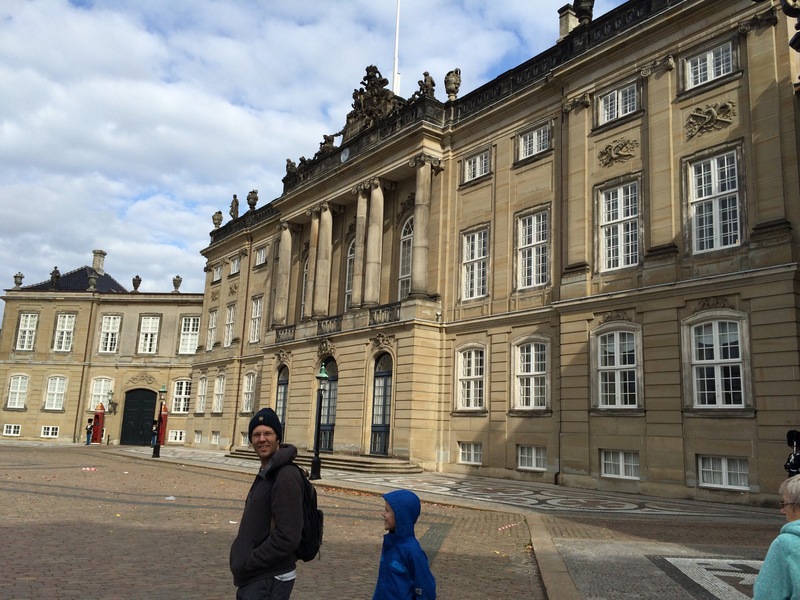 The palace behind Mark was where the Queen Dowager Ingrid lived until she died in 2000 and is now where the Crown Prince Frederik and Crown Princess Mary and their children live. This is a statue of Frederick V in the center of the courtyard looking very regal and slightly like a Roman soldier. Frederick V is revered here because he began the development of this area, with these 4 noble houses as the centerpiece, as Frederiksstaden. A view across the courtyard let’s you see down the road to Frederik’s Church, also known as The Marble Church. 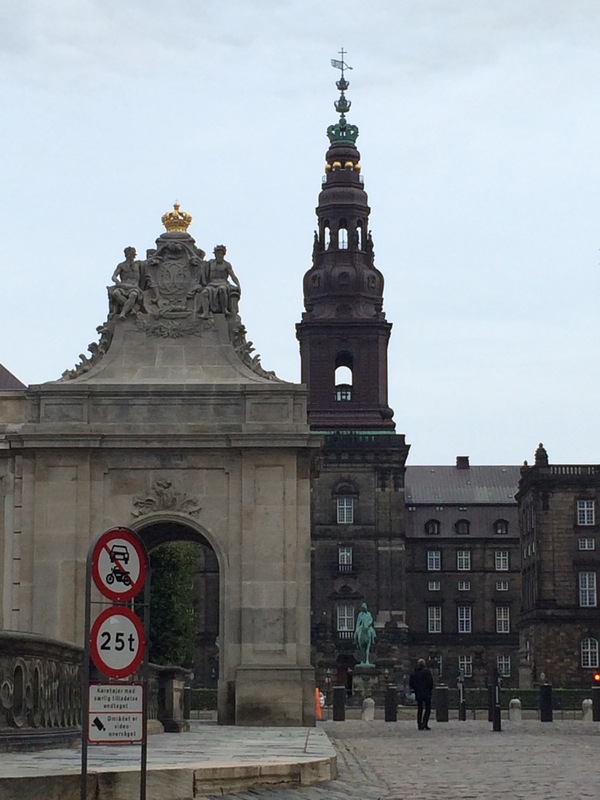 Christiansborg Palace – This palace is actually on a little island. It barely looks like an island; it looks more like there is a river that separates this little spit of land from the mainland and that another river separates it from Christianshaven, which is also technically on another island. There have been lots of buildings previously on this little island. Archaeologists believe that there was a little fortress here built by Bishop Absalon in the mid-1100s. 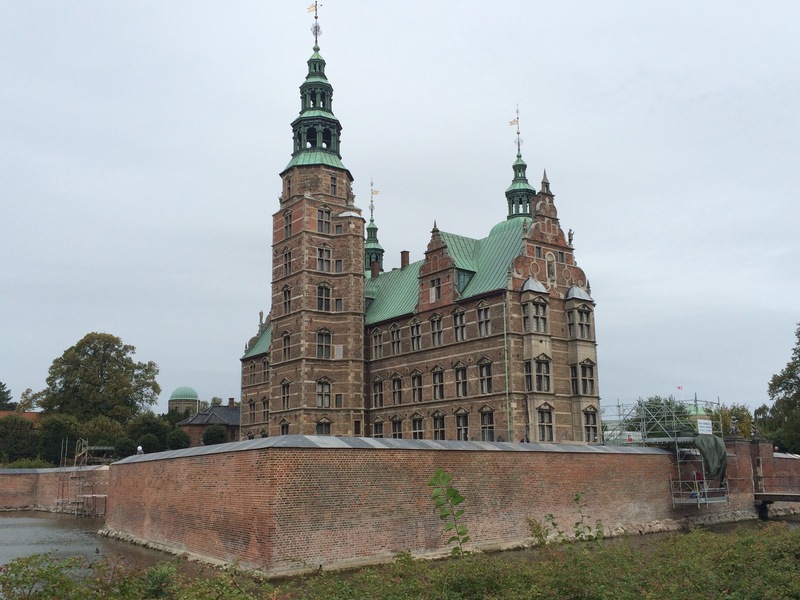 That was expanded in the Copenhagen Castle in the late 14th century by the Hanseatic League. Later monarchs added on and built up the Castle to the point where the foundations and original walls of the castle began to crack and they were forced to tear it down in 1731. 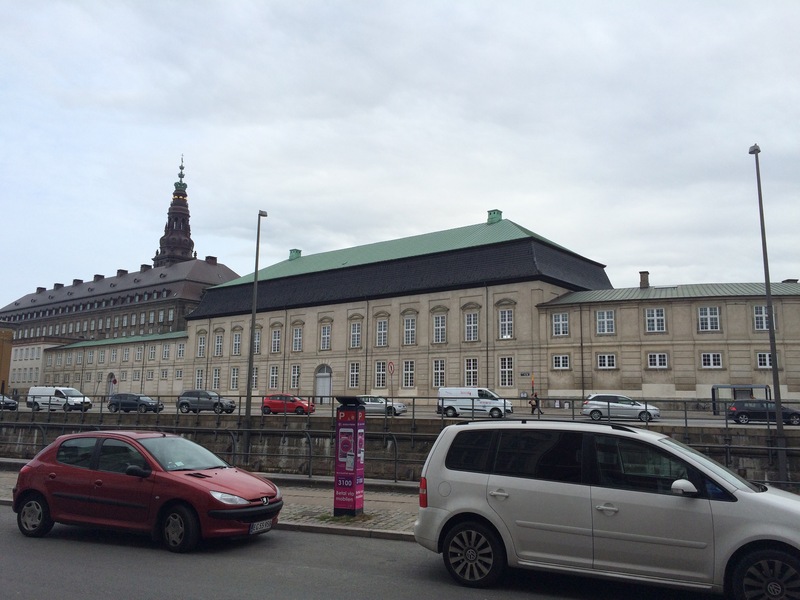 The land was too good to just give up to regular housing and so they decided they had to build another castle there and so the first Christiansborg Palace came to be. Unfortunately, after 50 years it burned down in the fire of 1794. They managed to salvage the bridge to the island, the theater, and the riding grounds with its pavilions, but the rest of it had to be complete torn down and rebuilt. 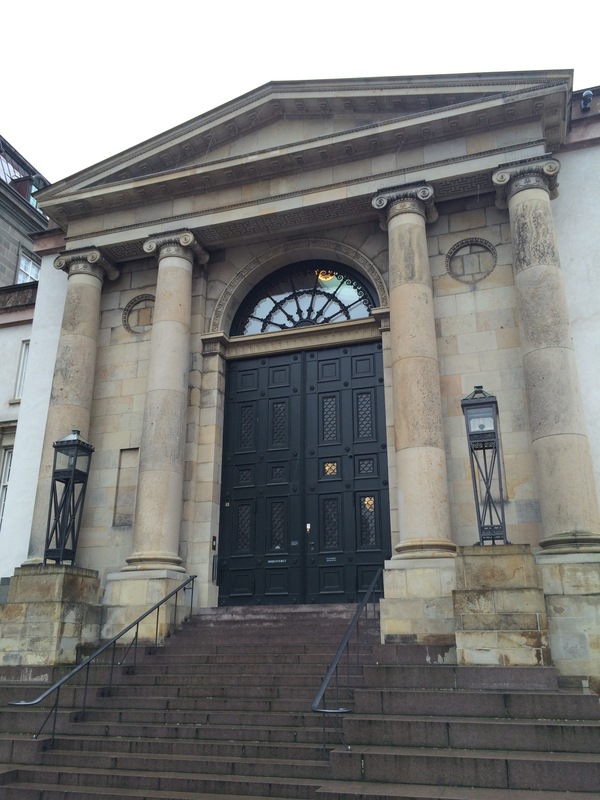 One of the sides of the new Christiansborg Palace. You can see the tower of the riding grounds in the background. The Palace is startlingly unguarded. I didn’t see soldiers or police or anything. 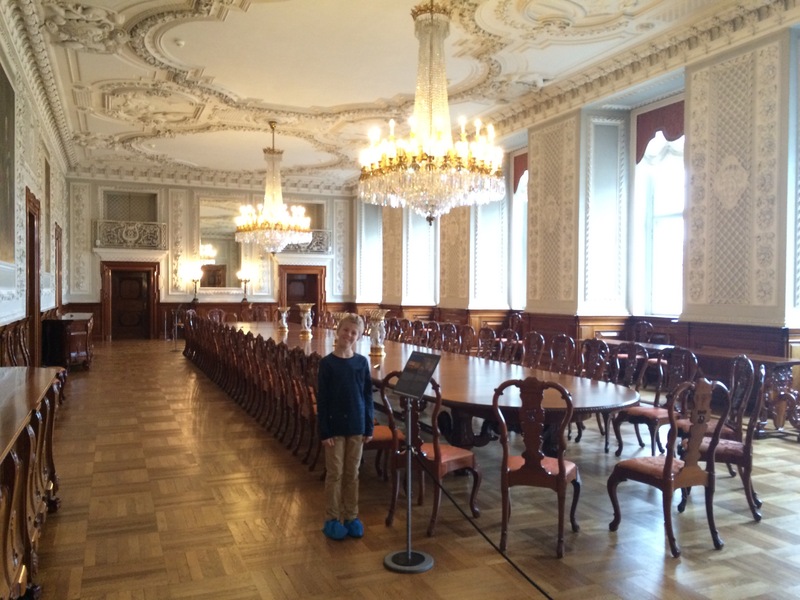 You just walk right in even though Christiansborg Palace is actually where the entire Danish government is housed. The parliament, the supreme court, and prime minister’s office are all inside this Palace. These are the “front doors” (or tourist doors) of the Palace. There are wonderful Greek god and goddess statues acting as the guards. Copenhagen has images of Greek and Roman gods all throughout the city and I will be featuring that side of the city in the next post. Here we have Athena, Nemesis, Asclepius, and Hercules. It doesn’t quite have a “welcome” sign on it, but there are no guards and we saw another touristy-looking person go on it, so why not follow them. Part of the Palace is open to tourists for a fee. I suspect the tour takes you through only a very small fraction of the palace and the rooms are those that you can probably see in media stories about the royal family. We also had to put on little blue plastic booties, which the boys found hilarious. I’m not sure if we had to put them on because it was wet outside or if they make everyone wear them to protect the floors rain or shine. After all, they do actually use this palace for some really important functions. The King’s Staircase is very grand and is one that has been photographed and published over and over. The self-tour through the palace takes you through The Royal Receptions rooms, which are very beautiful and elaborately furnished. 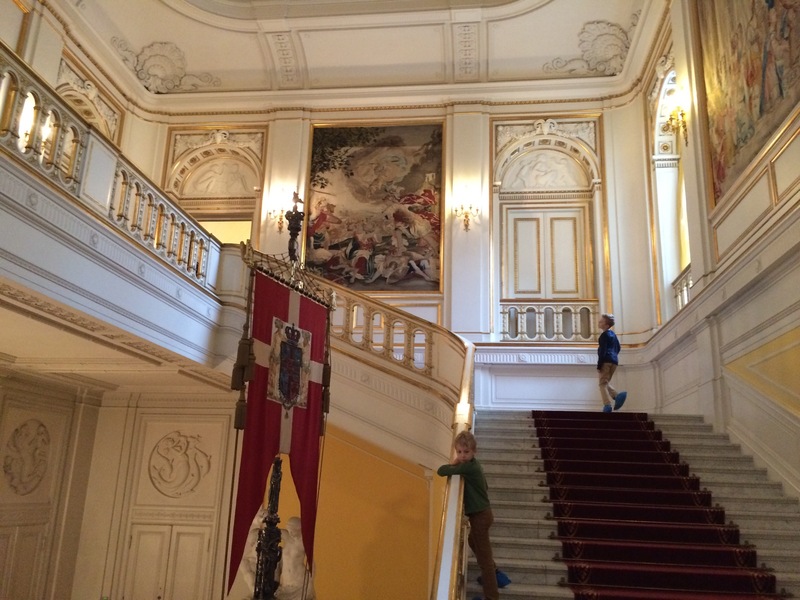 Christiansborg Palace has some really wonderful interior architecture. Some rooms are in a classic Danish Rococo and some are in a modern design. The perfect example of the blend of classic and modern embraced by this generation of royals can be found in The Great Hall where you can see the Queen’s Tapestries. 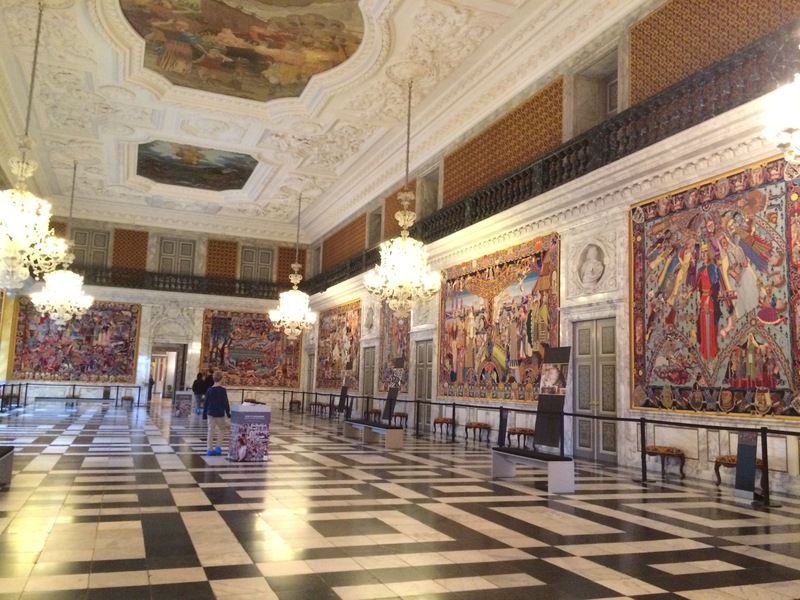 You can see the rococo architecture of the room and then on the walls are these incredibly colorful and abstract tapestries that Queen Margrethe II received for her birthday in 1990. They are known as les Gobelins and depict a history of Denmark – from the vikings to visions of Denmark’s future. 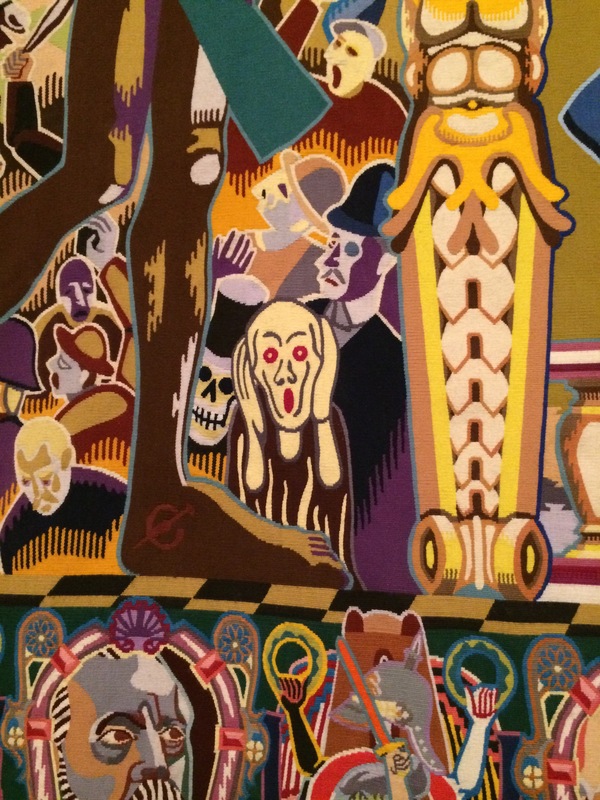 There are clever little “Easter eggs” inside the tapestries, like this guy below from Edvard Munch’s Scream. You really want to get up close and take your time to really see what is going on. A lot of you probably know how much I love libraries. 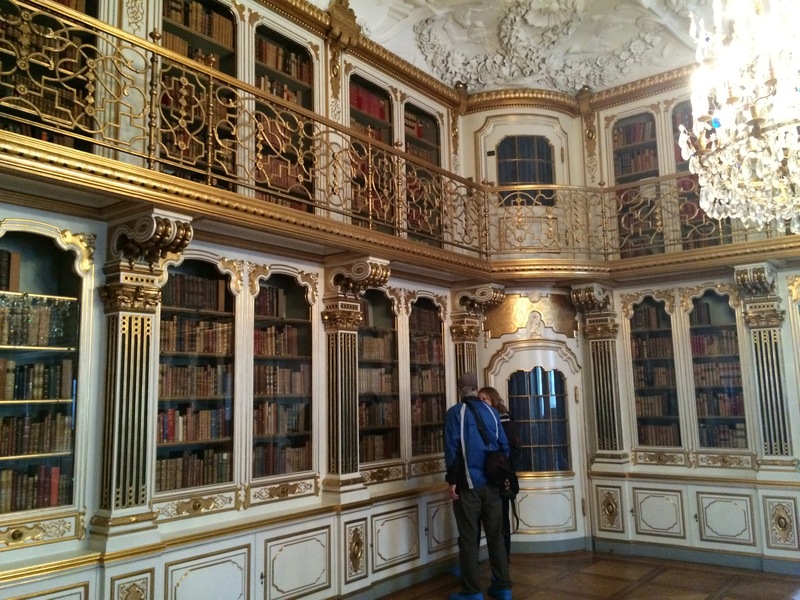 This palace has a wonderful, drool-worthy library. It’s not quite as elaborate as the one at St. Gallen, but it is beautiful. It’s almost a Beauty and the Beast library, what with the second story of shelves. 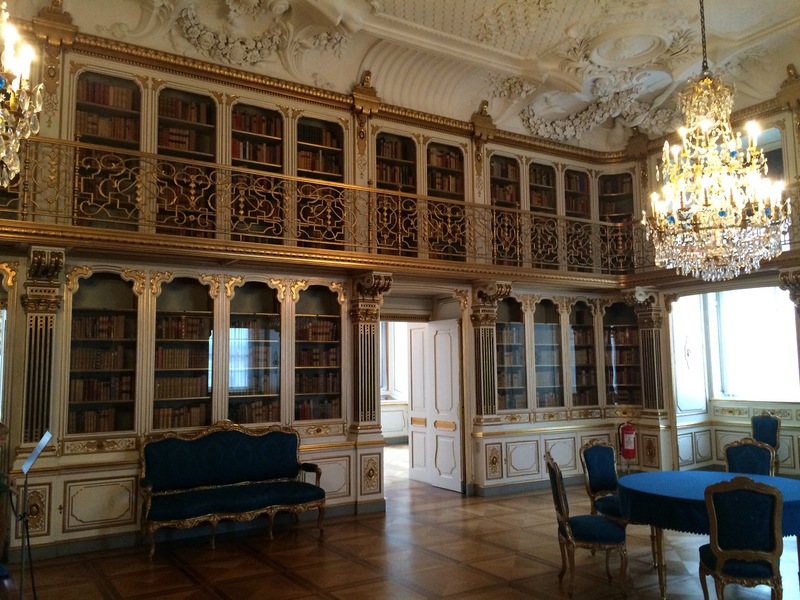 The books were interesting – de Tocqueville, Voltaire, Machiavelli, and lots of world and Danish history accounts. All leather bound and I would bet Dad’s farm that many of them were first editions. The ceiling mural is beautiful. Images of storks appear all over Denmark and they are an important part of the Danish culture. They are considered very lucky and there are lots of stories and songs that feature storks. The next room we saw was the Velvet Room. The guidebook says it is though that this room may have been modeled after the Red Room in Versailles. They certainly look very similar (Google it), however, the historians can’t find this intent to copy or pay homage written down anywhere. 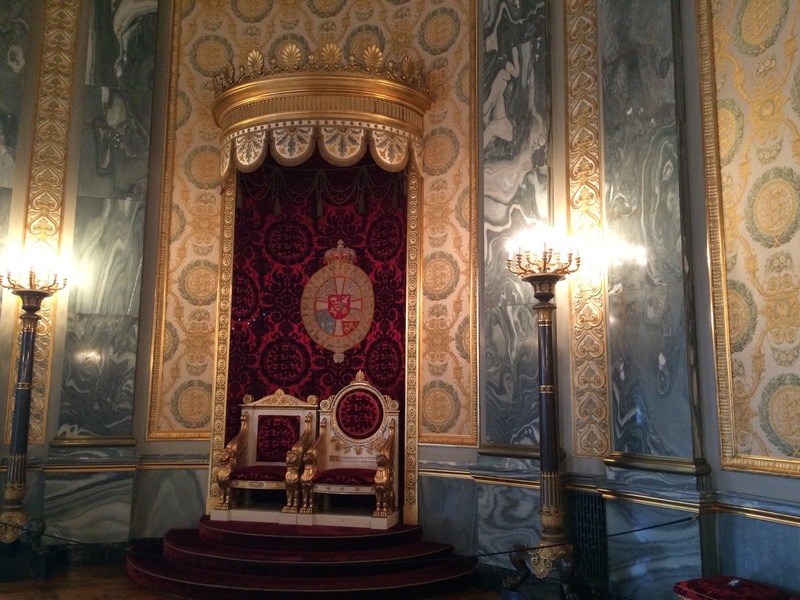 In a wonderful decision to make the rooms feel connected, they used some of the velvet wall covering to back the throne dais in the Throne Room. The taller throne is for the queen and the shorter throne is for her husband, who is the Prince Consort. I wish I had gotten a picture of the floor in this room. It has wooden stars inlaid in diagonal lines on the floor because, back in the day, to show your back to the king and queen was a sign of disrespect. So, you walked backwards, probably bowing as you went, and the stars would guide you to the door. Some big state or gala dinners for over 400 people are held in The Great Hall that I mentioned before, but for the more intimate meals of only 50 people or less they can use The Dining Room. As a person with over 90 family members (between aunts, uncles, and cousins), I can fully appreciate the necessity for a dining room this size. One Thanksgiving we had 60 people at our house. We had to eat in shifts. I peeled 50 pounds of potatoes. Yet another grand room the royals can stash people. Or use for the kiddie table at Thanksgiving. This place is so huge with so many doors that lead to different rooms you can have a family reunion here and successfully avoid anyone you don’t really want to see. And the beautiful black, gold, and marble decor give you something to talk about other than the weather should you happen to run in to that person. 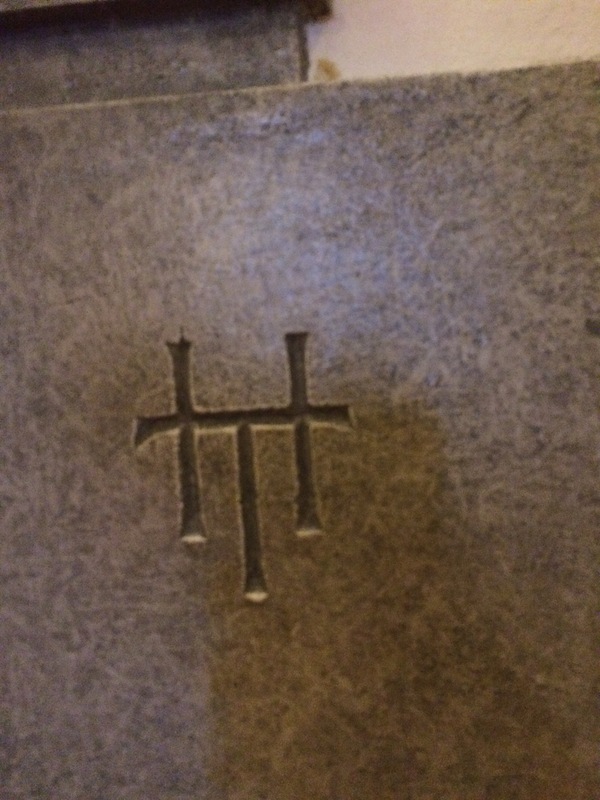 Something else I found completely awesome was that there were these little runes carved into random (or maybe not random) parts of walls and door jams throughout the palace. I have no idea what it means, but it is yet another thing I would consider doing in my own house. Some of my American friends are surprised when I tell them that Denmark has a King and Queen. They keep a low profile, but once you are in Copenhagen the monarchy is everywhere. And something I was really surprised about was how many other countries can trace their bloodlines back to Denmark. Specifically Christian IX, also known as the Father-in-Law of Europe. 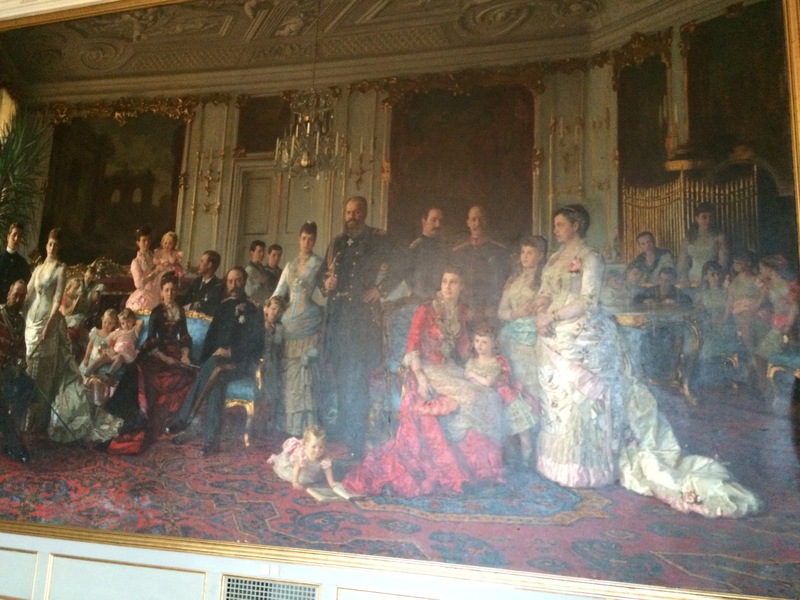 The picture below is an amazing family portrait of Christian IX and his extended family. Thyra of Denmark (who married Ernest Augustus, the Crown Prince of Hanover). The grandchildren are all in there as well – off to the side and in the behind the more prominent adults. 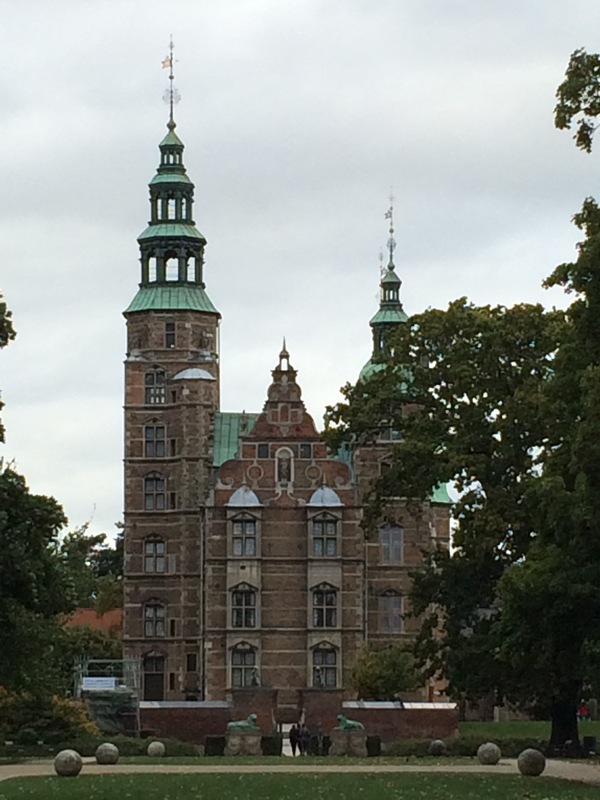 Rosenborg Castle – This is more a castle type looking building and was built in 1606 as a “summerhouse” for Christian IV. This is an example of the Dutch Renaissance style. It wasn’t ever really used as a home except for two emergencies. Instead, it is used to house the crown jewels and is where the coronation and knighting ceremonies are held. We bought our tickets at one of the outer houses in the castle compound and were immediately informed that the castle had free Wifi. AND one you logged into the network it would take you to the completely online and interactive castle guide! I was impressed at how high-tech it was and how much paper this probably saved them. The boys wanted to see the crown jewels first. So we went by the guards armed with automatic weapons (which terrified H) and down into the Schatzkammer where all the regalia was displayed. We were not disappointed! The first few rooms were full of items that were valuable, but also really interesting. 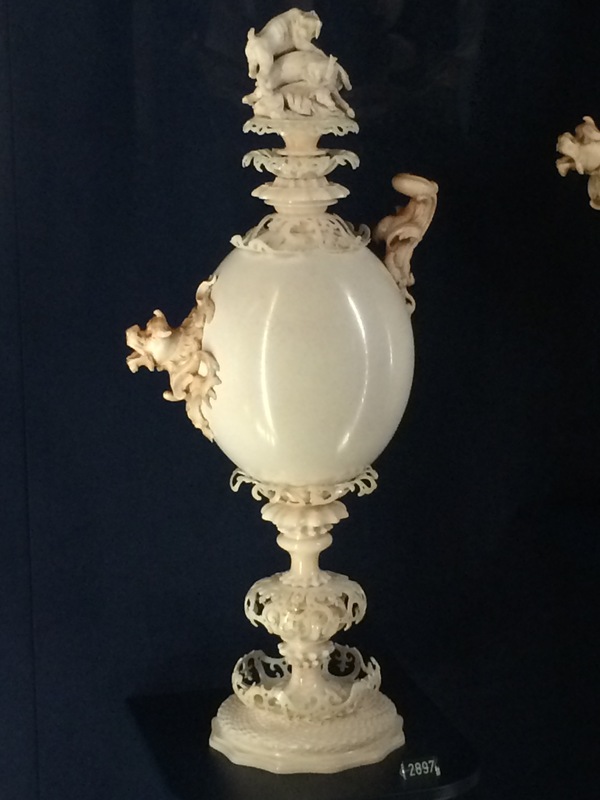 This is an ostrich egg that has been covered with carved ivory. It, and others like it, were gifts to the King. Often times the king would gift them with a white hunting falcon to thank them, which was considered a huge prize. The rest of the room is full of amber. Denmark has large deposits of amber from ancient forests. They have carved it and turned it into cups, jewelry, and ornaments. 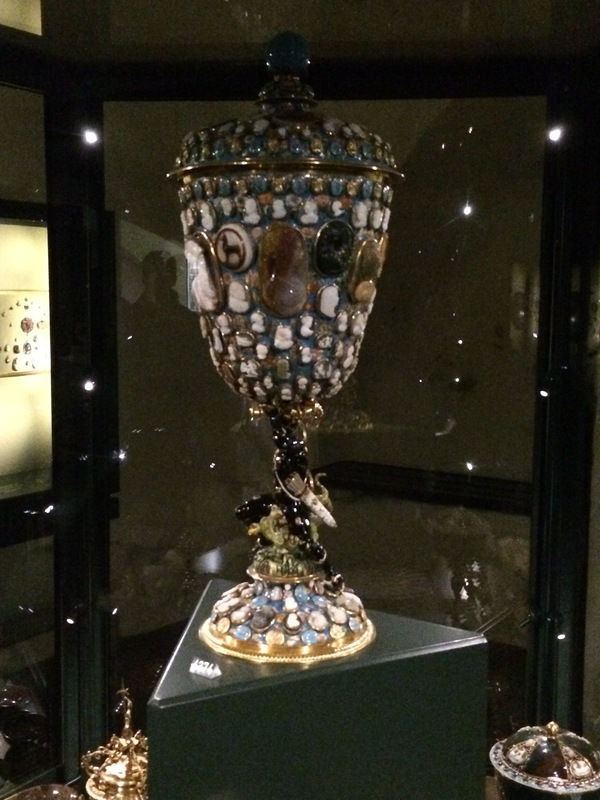 The piece below is a lidded cup with cameos of famous leaders of history inlaid over it. I thought it was one of the really special things in the collection. 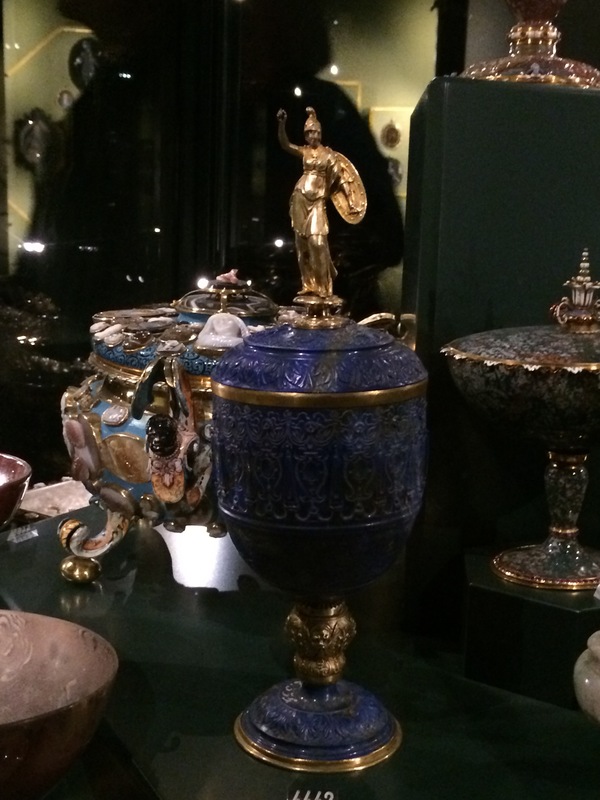 The other one that caught my eye was this cobalt blue cup with an image of Minerva/Athena on top of it. You pass through this room and a few others that hold ornamented weapons and scientific equipment used by Ole Romer, a noted astronomy who studied at the University of Copenhagen, and into the jewel room. It’s deep into the center of the basement and it has huge, thick doors that are closed and locked up every night. The crown below is Christian IV’s crown. It is covered with gold, pearls, and precious gems. It is, as the kids used to say, blinged out. The pink stone next to it – a pendant that you can wear on a chain – is a pink sapphire the size of a goose egg. It is huge. It is too big to be believed. The gold and emerald jewelry are part of Queen Caroline Amalie’s coronation set from the 1840 ceremony. The green of the emeralds are perfectly matched. She must have looked amazing that day. 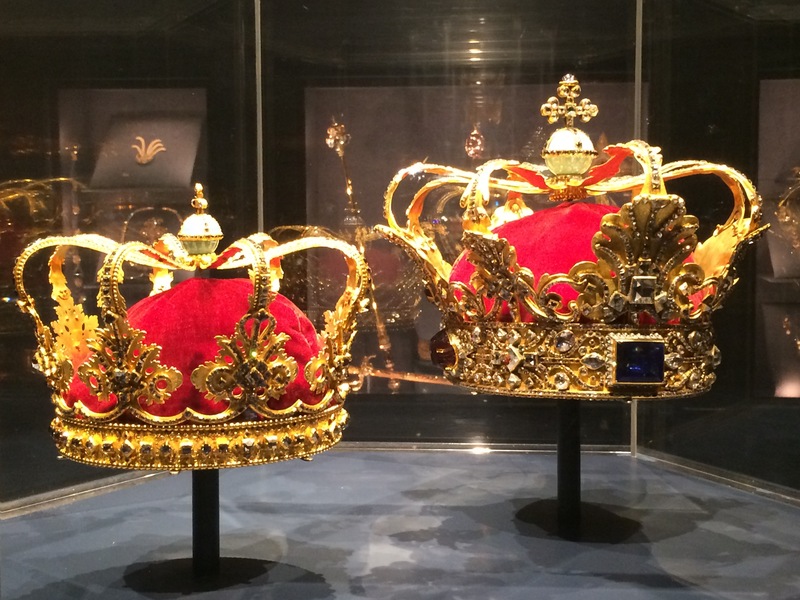 The crowns below are The Queen’s Crown on the left Christian V on the right. The Queen’s Crown was made for Sophie Magdalene in 1731 (remember that name – she comes up again later). Christian V’s crown was made in 1670s. The center square cut stone in Christian V’s crown is a sapphire is traced back to some the Frederik I’s regalia in 1474. 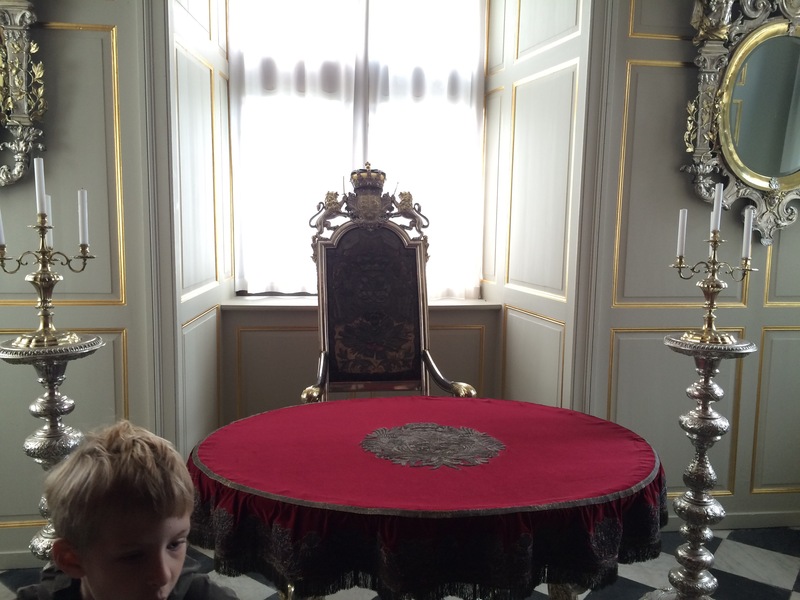 H took special interest in the crowns – enough interest to tap on the glass and make the docent watching the room leap over her desk to tell him to please keep his hands off the glass. He does have good taste. There is some significance to the shape of the crowns. I’m not going to go into it here, but if you are curious you can click on this link and find out more. When you decide to go up into the castle proper Christian IV’s Winter Room is the first room you see. 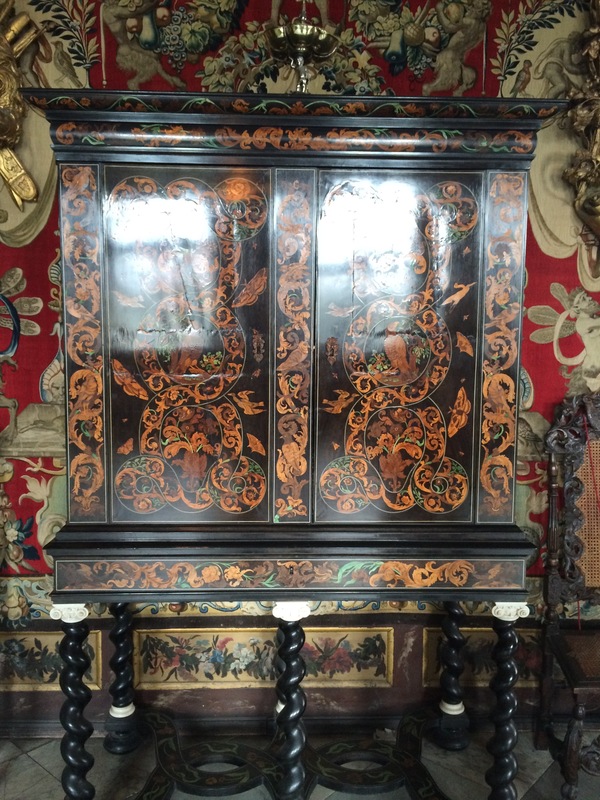 It is paneled with dark wood and almost a hundred paintings from Antwerp are inlaid into every panel around the room. 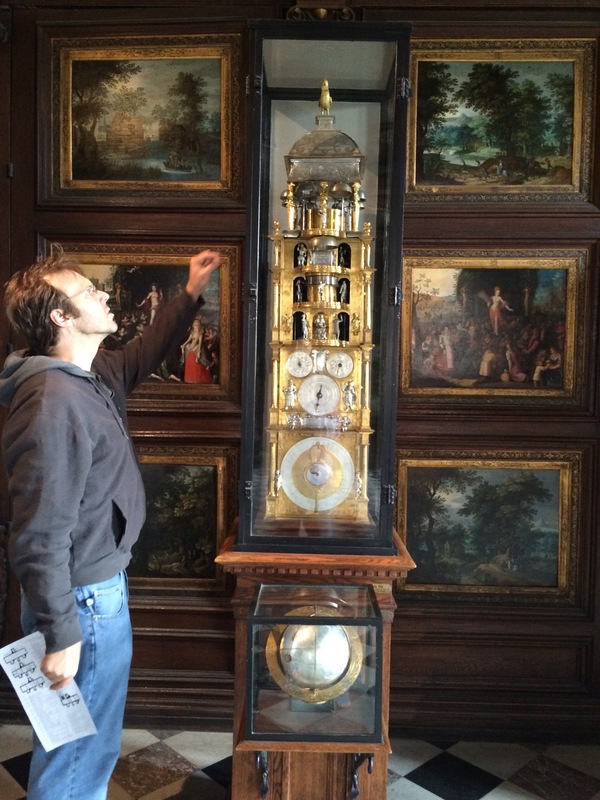 The main feature of the room is this beautiful astronomical clock. It was made in 1594 by Isaac Habrecht, one of the makers of the famous clock in the Cathedral of Strasbourg. 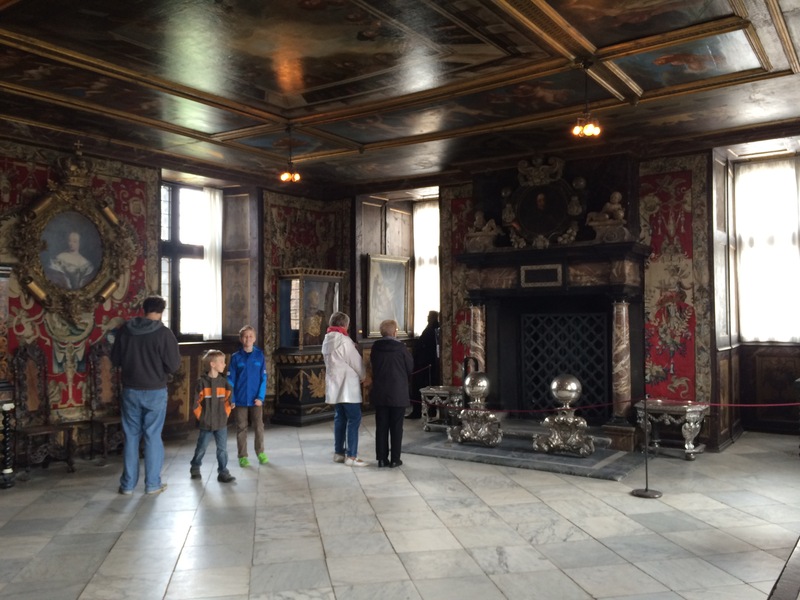 The tour took you through many grand rooms; too many to detail here and so I will show you some highlights. The picture below is of the King’s Chambers. 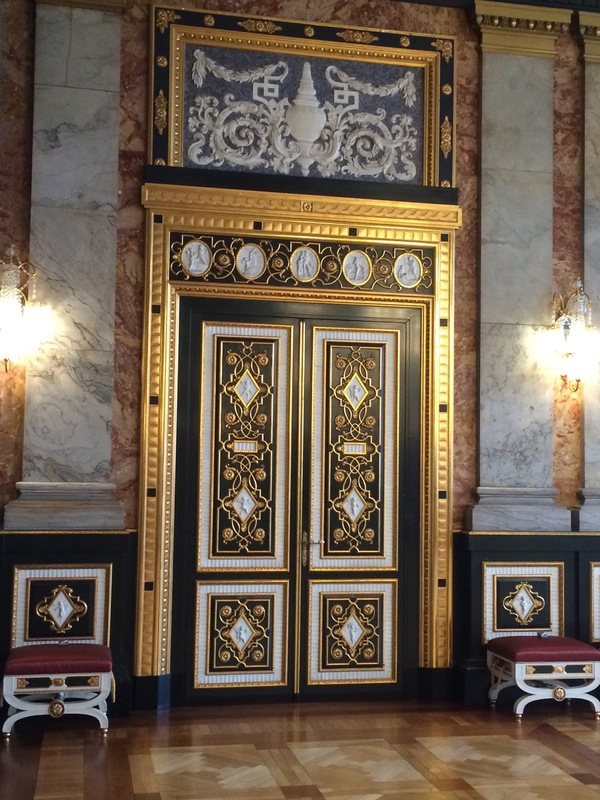 It was originally part of the Queen’s rooms, but Frederik III took it over as an antechamber to The Marble Room. The wallpaper is perfect for this large room and had this beautiful Japanese lacquer cabinet (pictured below). And this isn’t the only Asian item in the Castle. In fact, every room has quite a few Asian items in them. Japanese, Chinese, Indian, Ottoman. Porcelain statues, lacquer and inlay cabinets, carved ivory. Coming from so far away they must have been very princely gifts and must have given the throne of Denmark a lot of prestige. We snaked around the ground and first floors and then we took some steep stairs up to the second floor where we entered The Knights’ Hall. The literature says it was created to be a ballroom and that is easy to believe. It is a long hall with a tall arched ceiling. 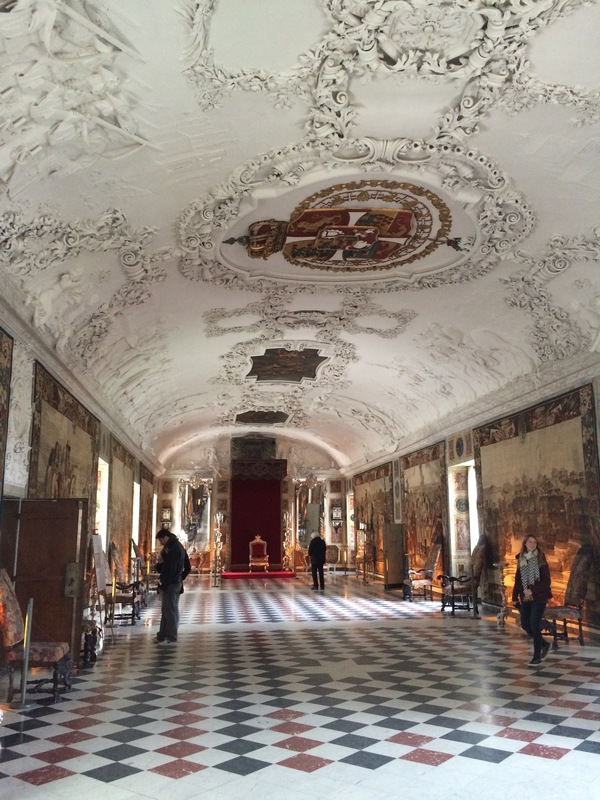 Tapestries depicting the battles between Denmark and Sweden cover the walls. There are grand chairs positioned around the room and some incredible silver end tables and other pieces of silver furniture around the edges of the room. There are also the thrones on either end of the hall. They are the King’s and Queen’s coronation chairs. 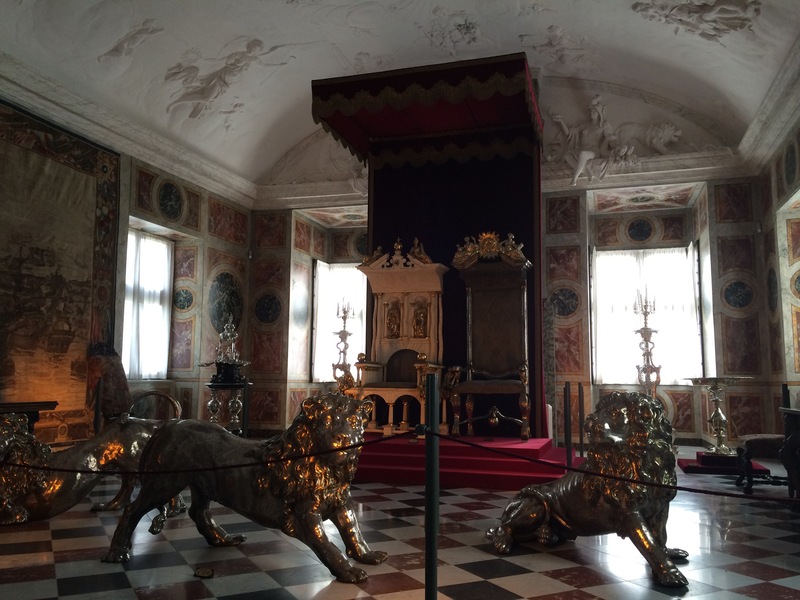 The three silver lions guard the coronation chairs. The literature tells us that they think they were commissioned to copy a story from the Bible about King Solomon who had 12 golden lions that protected his throne. The white King’s chair is made entire out of narwhal tusks, which completely floored Mark. I mean, how big do narwhals have to be to have that carved out of their tusks? 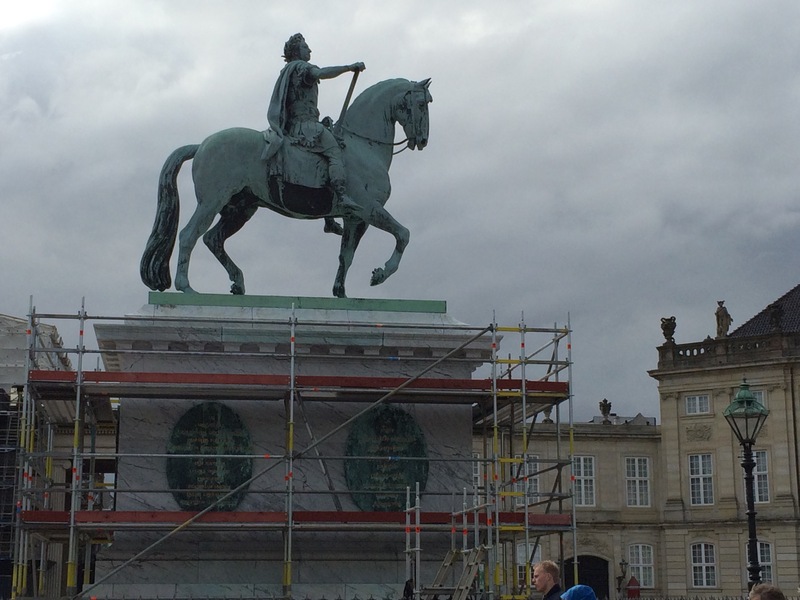 Because that wasn’t grand enough, King Frederik III told everyone it was carved out of a unicorn’s horn. The throne at this end of the room is the throne used for audiences. It is silver, like the other furniture in the room. Queen Sophie Magdalene had a great deal to do with the grandness of the furnishings. She, like Mary Todd Lincoln years later, thought that if you were a King you should live like one. She was hard on the budget, but she got her point across. This final room I will show you is the old regalia room. All those beautiful jewels were kept here. Now this room holds more silver furnishings and looks like it would be a place of quiet for the monarchs before having to go out to be seen. And it has, as E gleefully discovered, some secret doors! 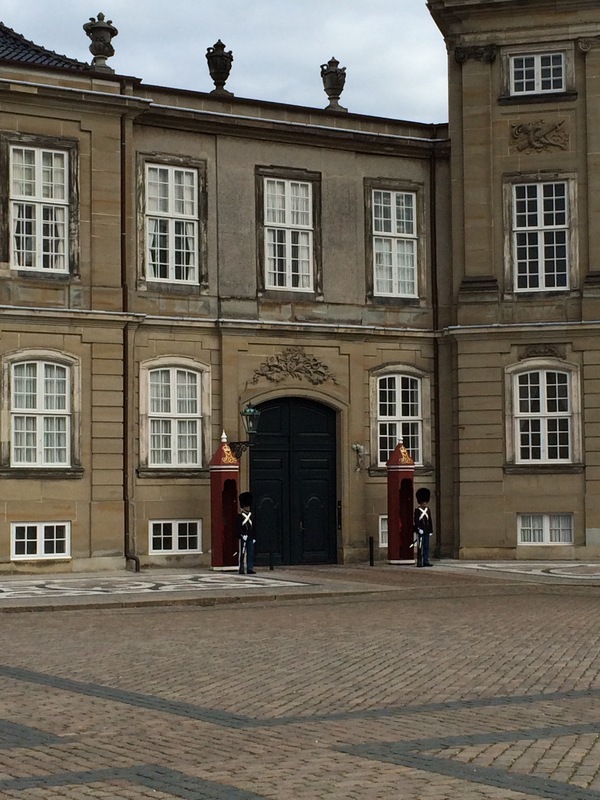 I was sort of surprised at how present the monarchy is in Denmark. 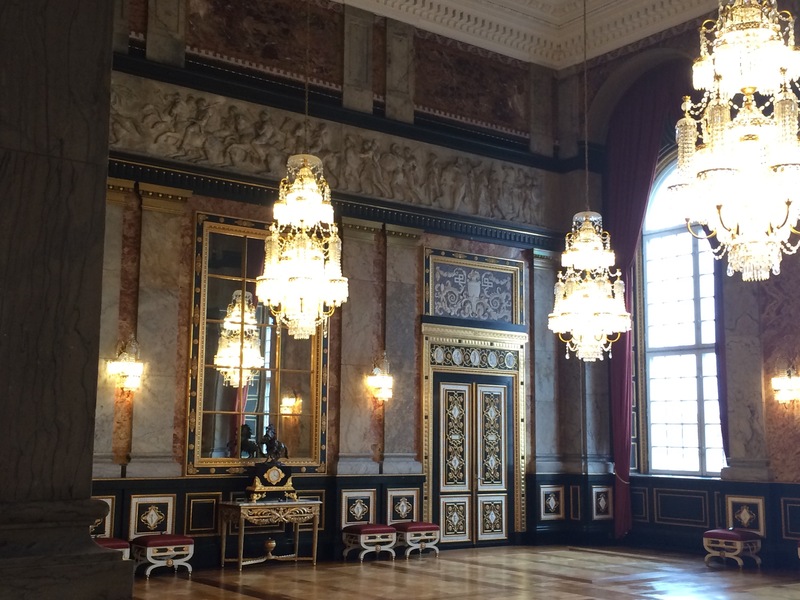 You never hear about them in America, but royal symbols are everywhere in Copenhagen. 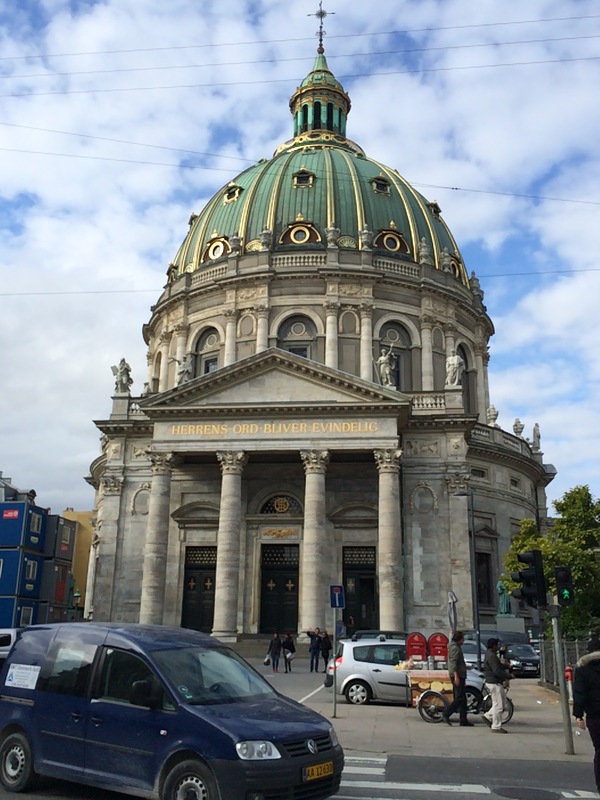 Denmark is a constitutional monarchy with representative parliament and a prime minister. The Queen (or King) is the Head of State and appoints the justices in the Judiciary branch, but the Prime Minister and the cabinet government wields the Executive power and the Legislative Branch is elected. And it’s hard to know what the people of Denmark think about having a Queen. National pride seems strong. The people are generally friendly and happy. The royals aren’t causing scandals. And the city of Copenhagen is beautiful; as you will find out in my next post.